Palm trees and water lilies, fresh clear water, dappled sunlight – is this paradise? With very few kilometres to go until we reach Adelaide River, we have time to detour to the water hole at Bitter Springs, just north of Mataranka. The water here is cool and inviting. Natural springs provide the perfect microclimate for palm trees. They grow in profusion here. No need to landscape. Nature has created what many hotels and resorts try to emulate. There is no smell of chlorine, the water is kept fresh, clear and clean by the plants, insects and fish that call this home. Pink water lily flowers decorate the fringes of the water hole. Tiny fish dart between rocks and tree trunks. Swimming, I look up through a crisscrossing network of spiders’ webs, strung like suspension bridges across the width of the waterhole. Huge black and yellow spiders are silhouetted in the sunlight. Suspended above the water, they are motionless in the centre of the webs they have spun. I am reminded of a line of poetry I learned at school, “what immortal hand or eye could frame thy fearful symmetry”. Fearful indeed. I swim away. 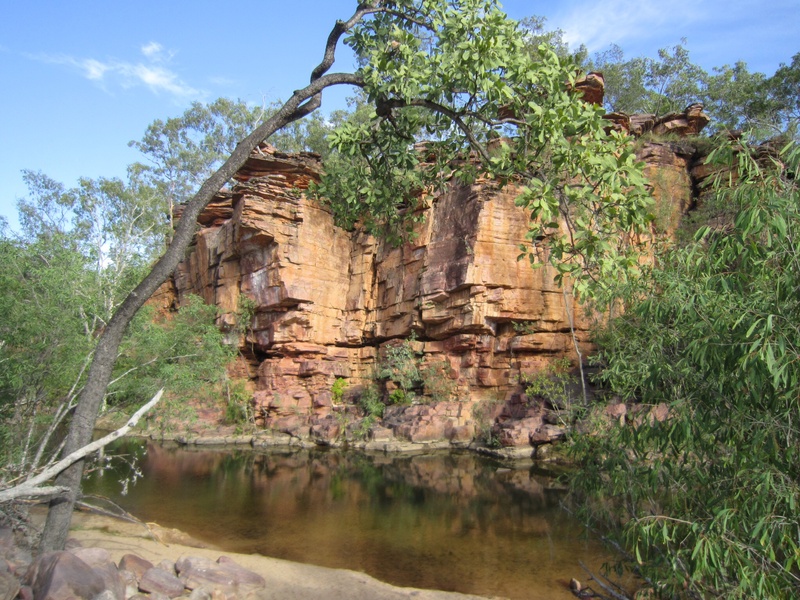 We are headed today to Umbrawarra Gorge, just south of Pine Creek. The dusty unsealed road takes us through creek crossings, winding towards the gorge. The Nature Park’s camping ground is empty when we arrive. Tents are up in no time, we are getting good at this now. Swimming togs on, we head off to the gorge. Is this paradise? It is an Australian garden of Eden. Water flows through the gorge over flagstones of pink rock, overhung with flowering gums that drip their golden blossom on to the path and into the water. Birds fly from tree to tree calling out a warning that the gorge has human visitors. The water collects in pools between rocky outcrops. Shoals of fish can be seen swimming there between the shadows. An elegant grey brown bird stands watching, waiting to take her daily feed. We climb over the pink rocks until the view opens out ahead. Pink and gold cliffs tower above us. Here’s the swimming spot. A perfect natural pool with a beach of crunchy golden sand. We return in the morning to walk further into the gorge. The morning sun reflects on the cliffs, deepening their golden hues. Above us there is a sacred aboriginal spot for women only. No photographs or men allowed. The climb gives the girls a cliff top view along the length of the gorge. The secret female artwork keeps its dreams to itself. The only art we see is found on the other side of the gorge: a male ancestor spirit drawn on a ledge high above the water. Hot from the climb, we hurry back to the waterhole. A monitor lizard suns himself on the bank, keeping a watching eye on us. 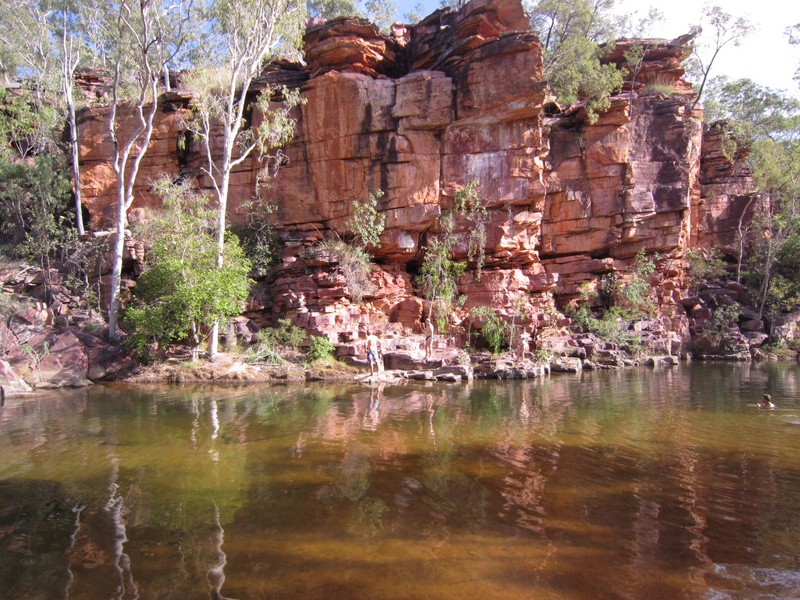 We plunge into the waterhole from the rocks, delighting in the refreshing temperature. Can’t we stay here longer? With our bodies and minds refreshed by our experience in this Australian paradise, we turn back to the camp and prepare ourselves for a mango smoothie at Mayse’s in Pine Creek before we head to our final destination as a convoy, Adelaide River and the races. This entry was posted in On the road, Swimming and tagged Australia, Outback, Travel on 02/06/2014 by Deb McSephney. Deb am loving your journey and just a suggestion for some reading while you travel – if you haven’t read it The Biggest Estate on Earth by Bill Gsmmage will be an eye opener. Thanks! I’ll see if I can get hold of it. I do think it might be paradise. It certainly always seemed that way to me, when I reached these wonderful, surprising waterholes. Your photos capture it beautifully. I keep reminding myself how lucky I am to live here. Thanks for dropping by.